Garden Tools Corner Blog: Good Quality Garden Tools Makes Gardening Fun! Good Quality Garden Tools Makes Gardening Fun! So you have got the garden bug and so off to the garden center to pick plants. Or your favorite garden tool website! Wait just a minute; before you leave the garden center, better run through a checklist and see if you’ve got all the garden tools you’ll need to make your garden the most productive. We aren’t going to break the bank here; no power tools and even a few you can craft yourself. We’ll touch on a few items that could be considered luxuries, but only if they make the job more comfortable and more fun. We can make this list a lot more organized by breaking the jobs in the garden into four main categories. 1. Tilling covers soil preparation and moving; turning over the soil. Keep in mind that this a small patch garden. Your most important tilling implement is a good shovel or spade. This is the workhorse, a real jack of all trades that hit almost every category. And I mean the Big Box stores. There is no point in going cheap here. I have taken the cheap route before, and you are lucky if the tool lasts one season. This is a lifetime purchase if done well; you will be back here in a year or two if you screw up, so buy the best you can afford. I am a big fan of all metal spades; I have had the one I am currently dating for a decade. 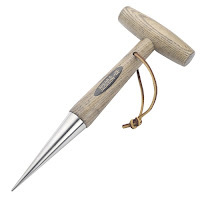 I am using this tool in a professional capacity and using it for my home garden; I have dug trees and shrubs, transplanted and split many perennials and grass, cut sod and roots, and even hammered a few stakes with it and I foresee several more decades of the same. A spade offers more versatility; the narrower blade and shorter handle make it easier for workers in a small garden. The shovel is a better choice for digging that big hole (and for saving your back), but why choose? I have both and suggest you do as well. If you do have that big area or are just establishing a bed, roto-tilling is a suitable method but a quick word here; I do feel that buying a roto-tiller is a good investment. Or you can rent one for the weekend to knock out that new garden makes much more sense, as yearly roto-tilling breaks down the composition of your soil (more so in clay soils). Repeated tilling also brings up weed seed that eventually decays if left in the depths of the soil strata. I till in compost at the end of the season, and that's it for tilling. This may not sound like a big deal but consider crabgrass. It can lay dormant at depths of up to three feet for 100 years, waiting to infest your bed and dive into the lawn. Breaking up the soil can be very difficult in clay situations, and working around established trees can leave you frustrated with the roots. The right tool for both jobs is a mattock. It looks like the offspring of a pick and a hoe and handles both these tough jobs and a lot of others. I do not own a pick; the mattock covers those bases nicely as well (I am fond of tools that multi-task). A spading hand fork is a beautiful tool for transplanting and aerating; two together make such an excellent device for splitting grasses and perennials that I have always had two hand forks (stab them back to back at the point you want to cut and work the handles apart). They will also do the job of a manure fork, sorting hay, mulch and the like, at least for a smaller garden. In the New England garden, rock is our constant companion, and those of you with hardpan know how difficult it is to break through. No list of tilling tools would be complete without the pry bar, or breaker bar. You know the one, 6’of iron bar just perfect for, well, prying and breaking things. This one gets a workout whenever I start a new bed, prying up the inevitable boulder or two that I run across. It also is another tool that can double as a pick, so we’re running out of reasons to own one. If we’re starting a bed, we’re adding compost and humus, mulching and perhaps even moving soil from one locale to another, so I include the barrows and carts in this group. This is a personal decision, based on what you intend to carry and your own personal limitations. The traditional wheelbarrow with the single tire up front is great for working in tight spaces, but it can be unstable with a big load, and anyone who has had to shovel a load of gravel off of a lawn will attest that it is not much of a labor-saving device if you dump it. 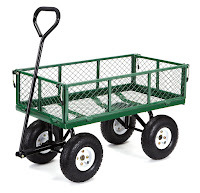 Garden carts, with the wide set bicycle wheels, are steady as a rock but don’t dump well and the wide wheel base can be a pain. While I own a traditional model, I have my new favorite, what we in the trade call a mulching monster, sort of a hybrid of the two other designs. The wheelbarrow body (good for dumping) is set on two garden cart type tires set about a foot apart (good for stability). Weeding is part of gardening face it, so you may as well have a helpful tool to work with. The image of a gardener hunched over his garden hoe, scraping weeds out of the soil, may be cliche, but for a good reason. Hoe's do an excellent job of keeping plants at bay, without having to bend down and grab them. 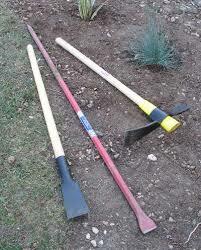 There are several types of hoes -- square, broad, V-shaped, bar-shaped hand hoe and they all do the job. You should try out a few to see which you find preferable. In general, a rolled steel blade that has been riveted to the handle will be the sturdiest. After that, it depends on your needs. Check the selection we have in store for you. I hope you can find one to suit your needs because weeding is everyone's favorite past time? I do not mind weeding. The sun on your back just feels right. The cultivator comes in two different flavors; long-handled and hand models. The long handled one is better on the back and the schedule, but the small one is the tool of choice around delicate plants and tight spaces, like containers and window boxes. If you are using a draw hoe, the long-handled cultivator is redundant, but if you prefer the faster hoes, it’s a good tool to loosen that baked-on surface layer in the depths of summer. I have both, and they both get a work-out. The hand model usually comes in a set with a trowel (we’ll cover in planting tools) and a long pointy spear with a fork on the end that you have wondered about, I’m sure. Well, it’s an asparagus fork, (for cutting the spears below the soil level) and before you throw it out (no, we don’t all grow asparagus) it does a famous job of digging dandelions and other tap-rooted weeds, so keep it! The other part of cultivating is cutting and pruning, and there is plenty to look at here. The spade may be Tool Numero Uno, but the pruners (or secateurs) run a very close second. There are a lot of different types out there but if you are only going to buy one pair of shears get a really good pair of by-pass cut shears. I have been a big fan of Felco #2’s since I started in the industry; they are the standard in the biz. Replaceable parts and blades mean you can bring these back to new in a few minutes (and we’re not talking about rebuilding a carburetor) so like your spade, you should have these for life. Pole pruners solve that “I’ll get the ladder out and prune those trees…just not today” problem. Most extend out to 18′ or so, letting you lighten up those lower tree limbs, and most of the people I talk to with “problem shade” only need to lighten up the bottom 20′ or so of their treescape to be able to garden to their heart's content really! So if you have ANY trees, this is a must-have tool. But what if we have to cut something larger than our thumb? The pruning saws have a ( tri-edge tooth) cutting blade. The cutting teeth have three uniquely shaped surfaces forming an ultra sharp cutting surface. This tooth configuration provides much larger spaces between each tooth for horizontal clearance of sawdust, fast cutting on the pull stroke and the tapered grind means efficient cutting performance. The blade is made of hardened high carbon steel containing a high-quality spheroidal carbide. This leads to a very flexible and durable saw blade which is then chrome plated to add additional hardness and rust resistance. BUILT FOR COMFORT - Large ergonomic high impact TPR rubber handle is not only super durable but comfortable with the grip. Pruning can tire the most active hands, but if you are already starting out at a disadvantage with carpal tunnel or arthritis, or have smaller hands, you should consider the smaller pruning saw. What type of rake do I need? When people hear rake, they think of the big plastic or bamboo thing used to make leaf piles. And yes, that’s a legitimate kind of rake, but it’s far from the only one, and not the best tool for gardening. Keep reading different types of rakes and tips for using rakes in gardens. Different Kinds of Rakes for Gardening There are two fundamental types of rakes: Lawn Rake/Leaf Rake – This is the rake that most readily comes to mind when you hear the word rake and think about falling leaves. The tines are long and fan out from the handle, with a cross piece of material (usually metal) holding them in place. The edges of the tines are bent over at about 90 degrees. 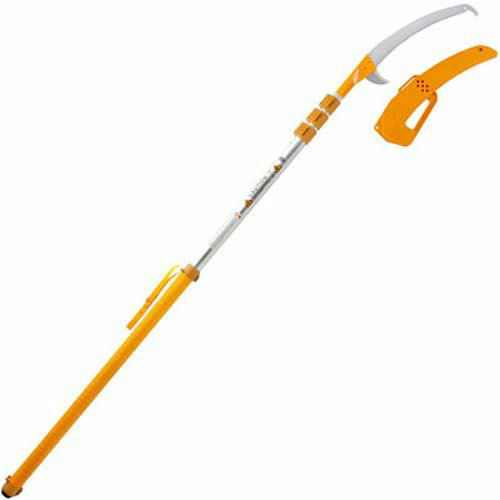 These rakes are designed to pick up leaves and lawn debris without penetrating or damaging the grass or soil beneath. Bow Rake/Garden Rake – This rake is a more heavy duty. Its tines are wide-set and short, usually only about 3 inches (7.5 cm.) long. They bend down from the head at a 90-degree angle. These rakes are almost always made of metal and are sometimes called iron rakes or level head rakes. 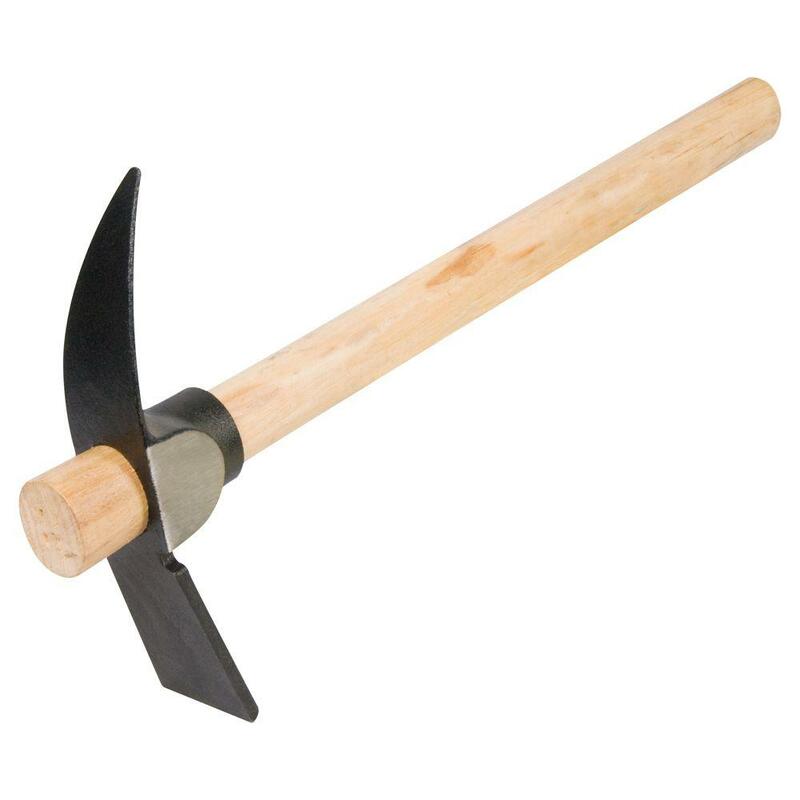 They are used for moving, spreading, and leveling soil. Additional Rakes for Gardening While there are two main types of garden rakes. Let’s find out. Shrub Rake – This is almost the same as a leaf rake, except that it’s much narrower. It’s more easily handled and fits better into small places, like under shrubs (hence the name), to rake up leaves and other litter. Hand Rake – This is a little, handheld rake that’s about the size of a spade. These rakes tend to be made out of metal for heavy duty work – and they’re a little bit like miniature bow rakes. With only a few long, pointed tines, these rakes are perfect for digging and moving soil in a small area. Thatch Rake – This means looking rake is a bit like a bow rake with blades on either end. I hope this will help you to make a decision on what type you need? Our spade heads the list yet again, cementing its lead as the tool to have. The spading fork can work here as well. Have a shovel or fork handle lying around? (I told you to use the pry bar to lever out those rocks…) Sharpen the point just below the D handle, and you now have a dibbler, or dibber, just the tool for planting bulbs! (If you don’t have the grasp, the pry bar does double-duty.) The trowel, that little hand spade, is the perfect tool for planting window boxes and containers or moving those little volunteer seedlings or any of those other small jobs that are so much of the joy of gardening. Maintaining green lawns, lush flowerbeds, or productive vegetable gardens usually means homeowners need to give Mother Nature a little boost. Proper watering tools including watering cans, hoses, sprinklers, and related accessories can make managing water levels a lot easier. Just be sure to buy the right tool for the job: That 25-foot hose may seem like a bargain until it can’t reach those farthest garden rows, and a tiny indoor watering can. Will not have the capacity for all those outdoor planters. When buying a garden hose, do not buy the cheap ones. Garden hoses are a necessity to all gardeners. Garden watering hoses are in the watering tool category and, as with any job, it is essential to select the proper watering tool for the job. 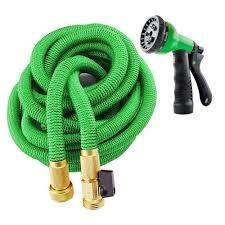 Using Hoses in the Garden There are also specific uses for specific garden hoses. Sprinkler hoses are capped at one end and water is then forced out of little holes along the gardening hose. Sprinkler hoses are often used for watering lawns or new planting beds. Soaker hoses are made from a porous material that allows water too slowly seep into the root zones of newly planted beds. The primary purpose of flat garden hoses is secure storage. Selecting your garden tools should be a fun and personal process; we’re all going to develop a cool tool list of our own. I have stuck to hand tools; power tools are a subject of topic for another day. Buy the best you can afford and maintain them; cutting oil and white lithium grease is what passes for love with your tools. Take care of your tools and they will take care of you. I have had my garden tools for years. I sell garden tools, and I have not had to buy any for years, either. Well taken care of. I hope everyone's garden is flourishing this summer. Ours is doing well, still waiting for some warm 60* nights?